Most of the movies made before sound hit the big screen will never be seen by our eyes. According to Martin Scoresese's Film Foundation, half of the films made pre-1950—and more than 90 percent of those made before 1929—are lost forever. And while not all of them are lost, you'll probably never see the films that remain, since they're rarely screened. 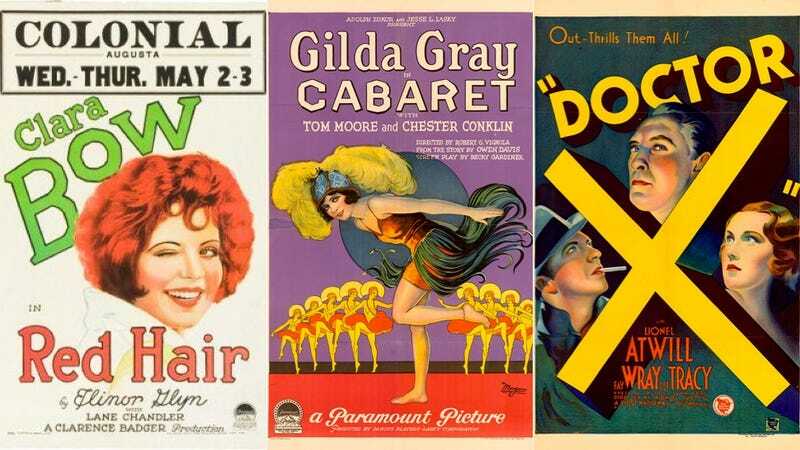 Their posters remain as last relics of Hollywood's beginnings. Doctor X, 1932, is actually not lost. It was preserved in 1978 and done up in technicolor when a print was discovered in Jack Warner's personal collection. 1928's Red Hair is lost, save for a color sequence preserved at UCLA's Film and Television archive. Only one reel of 1923's Flaming Youth survives. It's kept at the Library of Congress. All that remains of 1926's The American Venus are two trailers and two clips, housed at the Library of Congress. There is no known copy of Tip Toes (1927) in existence today. Any good posters we missed? Show us below.